Humankind is facing a very serious threat of pollution that is all around him. Pollution has its impact across all the dimensions. It is everywhere and inevitable because of his own activities. Due to his over exploitation and ignorance towards the nature lead him to face the consequences incapably. Technology is trying too hard to get rid of the situation and to make sure his existence. TZOA Environment Tracker is one tool to tackle this unavoidable circumstance smartly. It is not an ultimate solution but a survivor kit. This wearable has its significance indisputably. TZOA Environment tracker is an electronic gadget introduced by the startup Woke Studio. They specialize mainly in the development of gadgets that are essential for the day to day life. They have already gained enough reputation with some of their intelligent designs. Woke Studio range of products include Recon Instruments, Electric vehicle dashboards, Olympic torch of London 2012 etc. TZOA is dedicated to the people who want to survive the hard effects of contamination around them. The gadget has the ability to observe the surroundings and can bring information like Air quality, UV metrics etc. instantly. The gadget is designed to make its users aware of the presence of dangerous elements around him and to develop a wholesome routine. The device uses optical particle counter within it. Optical particle counter is an instrument used to detect and counts particle around using the applications of high energy light source. When the user is in move, the device continuously monitors the presence of suspended matters and determines the intensity of air pollution. It also detects the intensity of harmful UV rays. The device is helpful in getting the miscellaneous details like temperature, Atmospheric humidity etc. 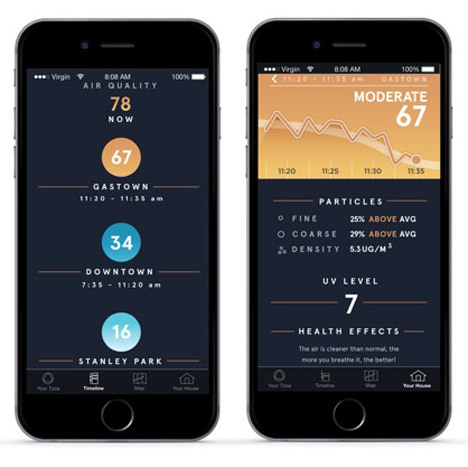 TZOA also provides city wide map of air quality with the chaperone smartphone app. With the dependable statistics it explains the effects and displays warnings to the user. The device is too light to carry and is designed with intense aesthetic sense. It looks very stylish and attracts the user to carry it with them always. Gadget comes with a mixture of metal and plastic designs. The circular plastic clip is very handy to hold it with any material with an elegant triangular metallic design on the front side which is interchangeable. The device will cost around $135 in the market and also the company is raising funds currently. A very large scale production can bring down the price indeed. TZOA is a better solution for the patients with the pollution prone lung diseases like Asthma, Bronchitis etc. to avoid the presence of contaminated air whereas healthy people can rely on the device to prevent complications. The device is a great contribution to the present world struggling to survive the adversities over the place.